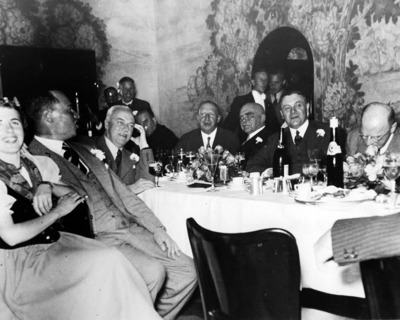 Defendant Wilhelm Mann leads the conversation in this picture taken at the Farben party in Peterberg. Mann is at extreme left while handsome guest next to him with hand to face in captioned as Hermann Schmitz. Others are unidentified.